In the rolling countryside around Fort McMurray, Alberta in the heart of the Canadian oil sands, you would think a drill rig would have all the room in the world. Nothing but blue sky above, and miles of open terra firma underneath. Just grab any old rig in your fleet and start counting your profits, right? Wrong. Like most everything in life, and in drilling, things are never as easy as they seem. 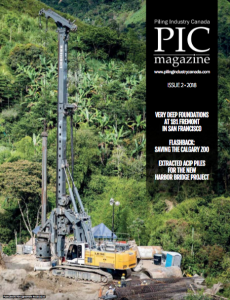 When Pacer Corporation’s foundation drilling division, Pacer Foundations, was contracted for drilled shafts at an oil sands facility they knew quickly that they would need a rig with some exceptional capabilities. Bernie Leroux started Pacer’s piling and foundations unit, Pacer Foundations, in 2003, and has been supervising field operations with Terry Powell as general manager, and Dan Berg as president. Pacer Foundations has the experience and the equipment to handle driven piles, concrete piles, micropiles, screw piles, caissons, and earth retention. Pacer’s fleet includes six Soilmec SR-30s, two Soilmec SR-50s and one Soilmec SR-65, and two Watson 1100 truck mounted rigs, but none of those rigs were candidates for this job. The Pacer job includes 2,000, 48-inch (1,200 milimetre) diameter shafts that were 40 feet (12 metres) deep. Some of the shafts are drilled at 45 degrees for battered piles. Soil conditions include, sand, silt, shale, and large boulders, where a core barrel and extra force is required to get down to the desired 40 feet (12 metres) depth. These shafts will be used to create support structures for racks that will secure active oil pipelines overhead, as well as large oil storage containers and various outbuildings. The rig of choice for Pacer in this job was a LoDril DH40 manufactured by Bay Shore Systems. Mounted to a new Komatsu PC 290LC-10, this standard DH40 has 43,000 ft-lbs (58 kN-m) of rotary torque. Pacer’s rig is built for a 60 foot (18 metres) drilling depth that gives them plenty of capacity for the 40 foot shafts. In addition to the rig he bought from Bay Shore Systems, he rents a second from KI International – also a DH40, but this one mounted on a John Deere 350. The advantage of an excavator-based rig such as the LoDril is not only the ability to move around and under or reach over obstacles, but also to have more control over spin off locations. As with all new equipment, proper training in maintenance and operations is critical to the most effective use of the machine. Specialized training of support staff and operators reduces downtime and increases effective production. And, since LoDril work can potentially bring in a 30 per cent higher hourly rate compared to other drill rigs in Pacer’s fleet, keeping the LoDrils turning is both a production and revenue generating priority. The side tilt and angled drilling capabilities of excavator based rigs such as the LoDril make batter piles much easier to drill. The Pacer project includes numerous batter piles, typically drilled 4:1. Quick set up and alignment features of the LoDril help to make certain that the shafts remain true. Pacer Foundations expects to spend another month or two on this job and then move the LoDrils to a similar project at another facility. Clearly they have found the LoDril to be a perfect match for their difficult oil sands project.